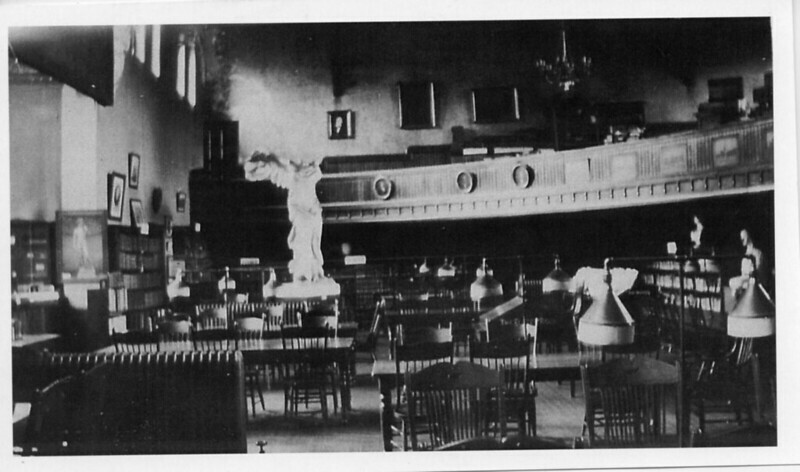 Here is a shot of the North side of Alumni Hall taken in 1895 and featured in the 1896 Gale. Seems to have been taken before South Street was paved! If you look past the trees on the right side of photo, you will see the area where Seymour Hall will eventually be built. 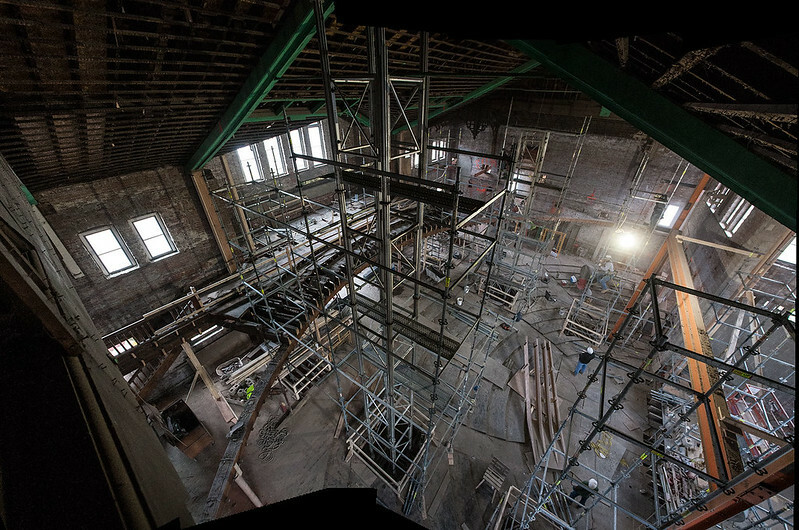 As seen in recent construction update shots, the center hall of Alumni Hall is a large area with a stage and space for seats — an auditorium. It was originally intended to be a chapel, but over its tenure thus far, it has also been an auditorium, a theatre, and a library. 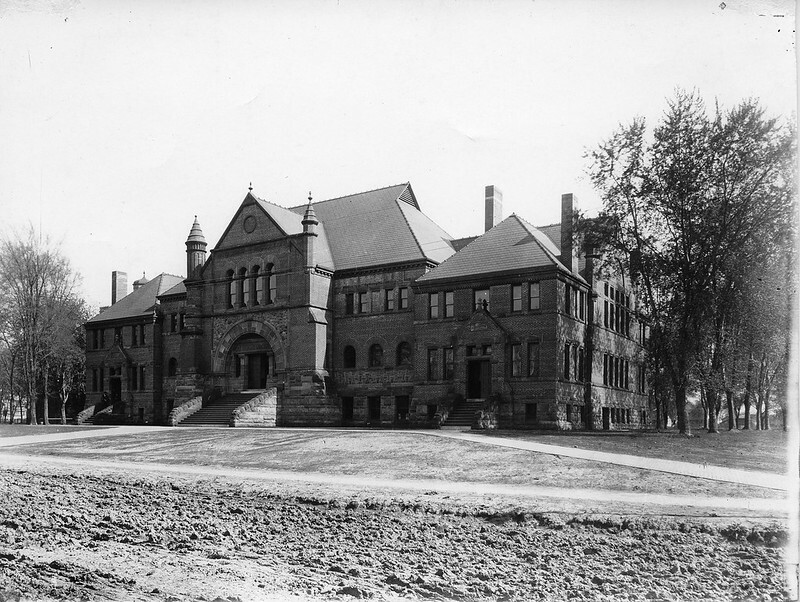 The original Knox College library was housed in Old Main, while Alumni Hall’s center hall was serving as a chapel. After Beecher Chapel was acquired by the school and the need for a larger library was realized, the books were moved to Alumni Hall in 1909. This wasn’t the first time a library was in Alumni Hall. Both literary societies, Adelphi and Gnothautii, had separate libraries on their sides, starting sometime around 1892. 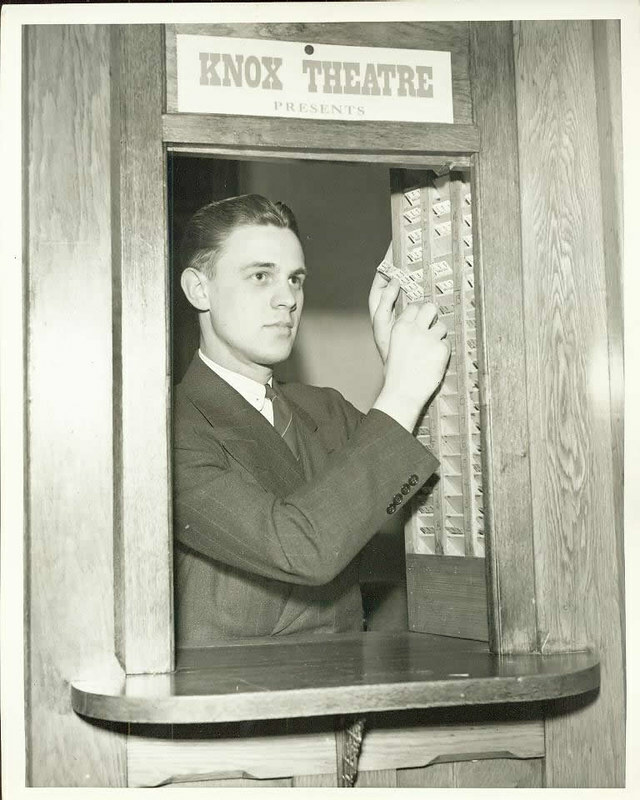 Once the College’s library was moved to Alumni Hall, the literary societies combined their books and contributed to the centralized collection. The library featured not only books, but two large tapestries from the 1893 World’s Columbian Exposition in Chicago. 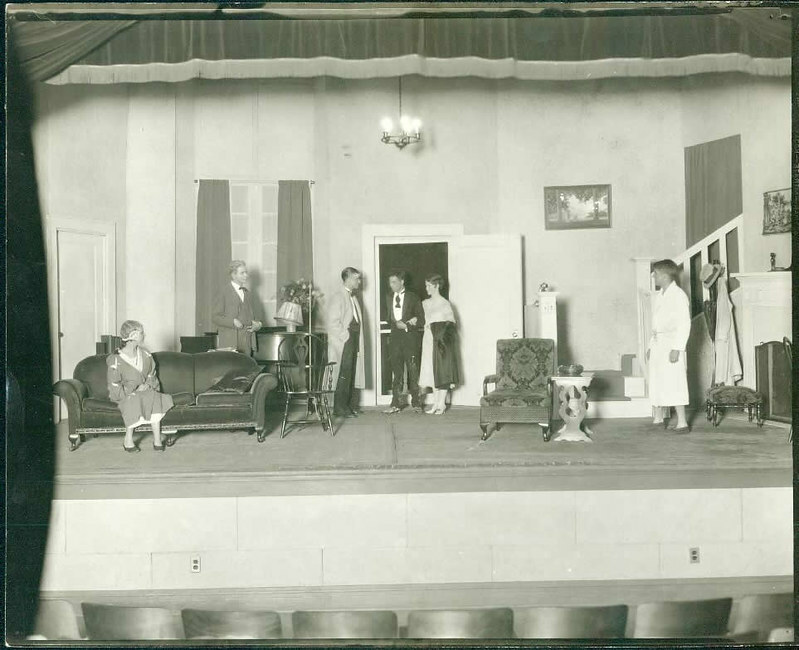 They framed the stage, as seen in the photo below. Flooring was laid down from the lobby to the stage to level out the slope intended for auditorium seating. 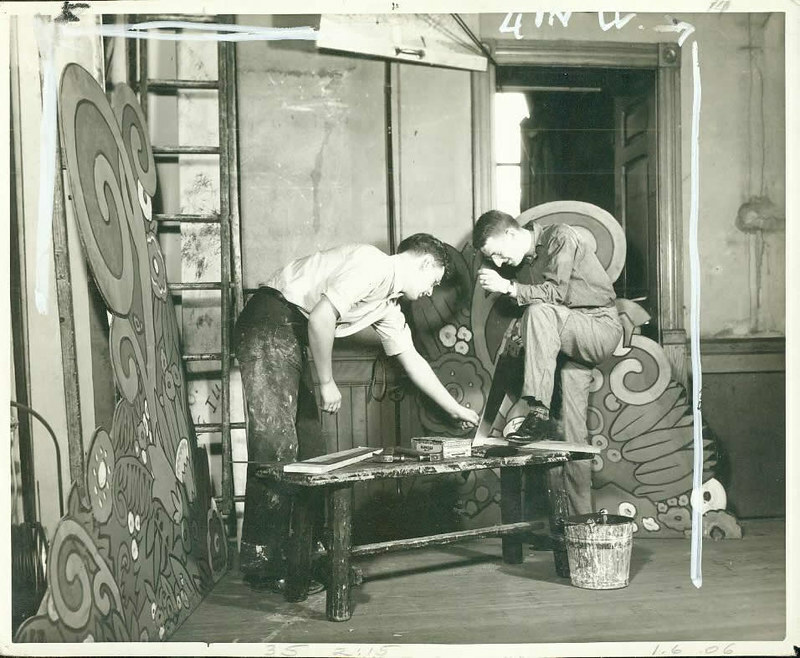 Two staircases were installed to reach from the bottom floor to the top balcony where Dr. Elder, the librarian, had an office and additional stacks were housed. 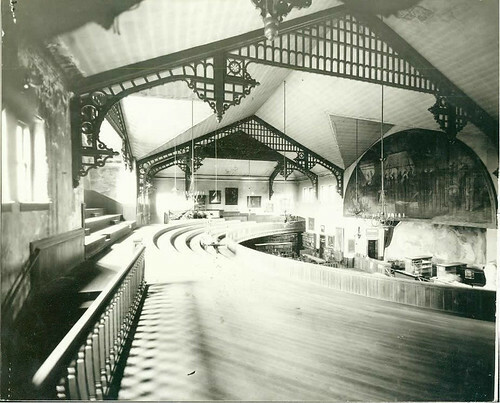 The center hall of Alumni Hall remained this way until the completion of Seymour Library, which still houses Knox’s collection of books and library materials, in 1928. As seen in the photo above, books lined the back walls of the lower level, and tables, chairs, and even statues decorated the area. It wasn’t intended to look makeshift, although it was a temporary solution. 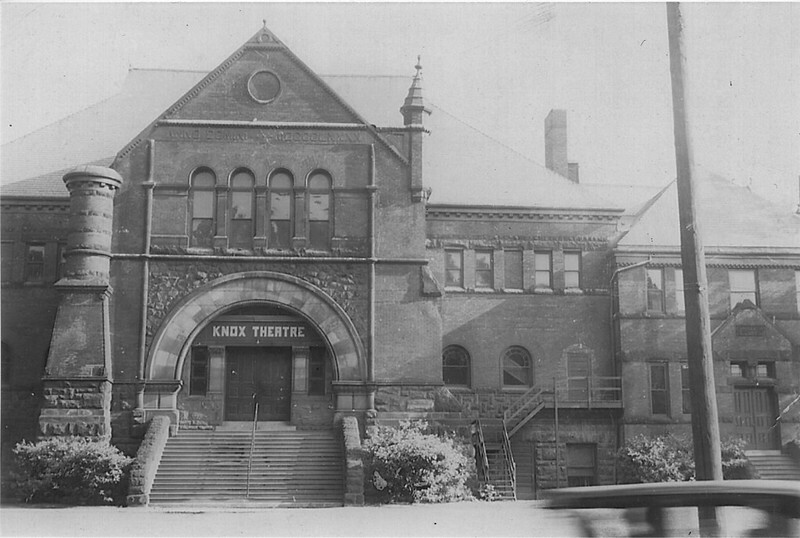 From the convincing looks of it, it probably fooled a few students between 1909 and 1928 who would’ve never known it was an auditorium space. Alumni Hall’s library viewed from the balcony, featuring tapestries from the 1893 World Exposition over the stage.